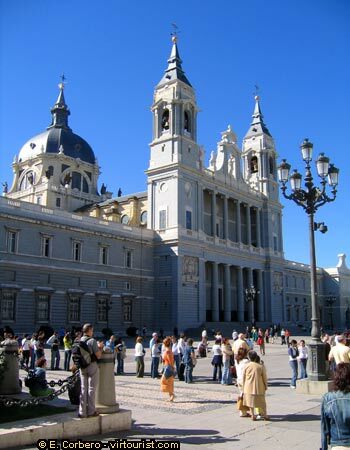 Although the construction of the Almudena Cathedral did not start till the 19th century, its story begins in the 16th century, when the king of Spain sets the capital of Spain in Madrid (1561). He thinks, as almost all his successors, that the capital has to have a Cathedral. In times of Felipe IV (17th century), doña Isabel de Borbón, the king's wife, donates the money to build a cathedral dedicated to the Virgin of la Almudena. The works did not start till 1883, though. Finally in 1993, the cathedral of Madrid was consecrated! Since 1885 through the inauguration of the Almudena, the "Iglesia Catedral de San Isidro" was the Cathedral of Madrid. This church was built at the beginning of the XVII century next to the Austrias Imperial School. Since 1768 the remains of Saint Isidro Labrador and Saint Maria de la Cabeza rest in this Church.